How do I eat it ? 1. Clean my ear rings. Just add pinch of baking soda to a bowl of water and leave your ear rings in the bowl overnight. By morning the dirt will be off the ear rings. 2. Clean my mixie jar stains and greasy oil lamps. Just add handful of baking soda to a tub of water and immerse your utensils, lamps whatever in the solution overnight. In the morning just use an old toothbrush to make it clean. Don’t worry you do not have to spend too much energy or time cleaning them which you would otherwise. Just a quick brushing is enough. And your utensils, oil lamps will be spotless clean. 3. Clean stains on wooden tables. Rub some baking soda (+ some vinegar if you have it) with few drops of water and leave overnight. Wipe in the morning with damp cloth. 4. Clean stains on clothes. Rub some baking soda with few drops of water and leave overnight. Wash just the stain part in the morning or just put the clothes in the laundry as usual. 5. Sprinkle some baking soda in your kitchen dustbin if it is smelly. It absorbs bad smells pretty quickly. 6. Once my neighbors cat poo’d on my carpet. I used baking soda to get rid of the smell. 8. To mop the floor. Add handful of baking soda + your favorite essential oil for a nice aroma and to keep bugs off your house in a bucket of water and mop the floor! If you know any other uses please share it here. 4. Dry herbs of your choice for smell and taste. Mix all well. Store in a jar. Use every morning and evening as toothpaste. 1. 1/4th cup sprouted wheat grains. 2. 1/2 cup sprouted black lentils. 3. 1 bunch cilantro/parsley chopped fine. 4. 1 bunch dill chopped super fine(optional). 5. 1 large onion chopped. 7. Pinch of grated ginger(optional). 8. Salt, oil and lemon juice to taste. You can optionally steam the sprouted grains and lentils, but steam on light steam and only for 2-3 minutes so not to loose the crunchiness of the grains. I wanted to share about Oil Pulling which I recently came to know about. I went to the dentist for yearly dental cleanup and she said my wisdom tooth has cavities and since my brush cannot reach there as my jaw is too narrow it is better to take it out. As I follow acupressure for self I know that each tooth is connected to a meridian. So I decided to check for some alternative therapies for dental issues and I found about oil pulling, which is basically taking a tea spoon of organic cold pressed sesame/olive/coconut/sunflower/ oil and doing a swishing or pulling in the mouth for 20 minutes before brushing the teeth every morning. Since around 2 months I and some of my friends abroad are doing OP. The benefits we have got until now are : Cavities healing slowly, no more headaches, skin disease healed, no more bad mouth odor, no more bad body odor, blackened gums turning pink again, no more cold or hot sensitivity at some gums. Also please note that some people experience healing crisis / detox symptoms for first few days of doing Oil pulling like fever, headache, skin rashes. Please do not stop doing Oil pulling though. After 3-5 days the symptoms will vanish. Please note that we do not gargle but swish the oil. Here is a video . 1. 1 cup buckwheat . For the dressing please see Vegan buttermilk. 1. 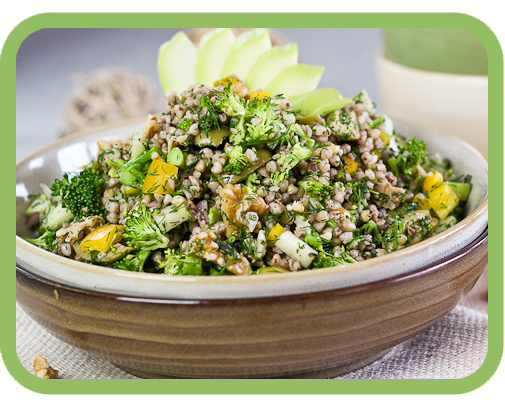 If you are 100% raw, just soak buckwheat for an hour. If not, steam it for around 10 minutes. Make sure it does not get pasty. The grains should still be separate and with intact shape. 2. Dice cucumbers and onions into medium size cubes. 3. Wash and drain buckwheat under cold water. 3. Pour dressing over, mix well and refrigerate or just refrigerate the salad and pour dressing while eating. You can add any other vegetables to the salad like Lettuce, Broccoli, Tomatoes etc. if you like. Serves 2 on a hot summer noon. 1. 1/2 cup Sunflower seeds. 2. 1/4 cup Coconut milk. 3. Juice of 1 lemon. 1. Blend all with just enough water to get a yoghurt like consistency. 2. Let it ferment for 2-3 hours depending on the weather. 1. Just as you would use yoghurt for any dish. 2. 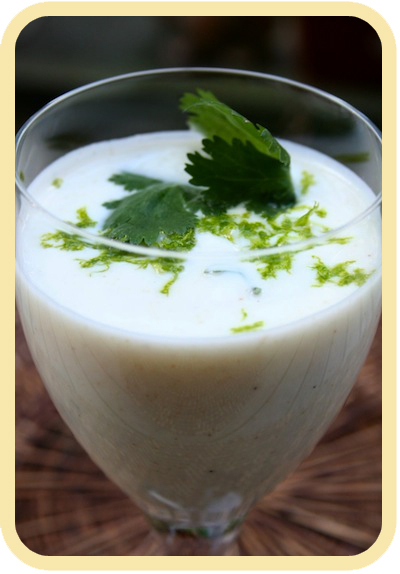 Make buttermilk by adding lot of water and salt/sugar/spices to taste. 3. As a salad dressing like in Buckwheat Salad. 0. Ready the steamer. By the time we reach step 4, the water should be boiling. 1. Mix 1-5 ingredients well. 2. Slowly make it into a dough by adding water little by little. The dough should be almost like bread dough. 3. Make small shapes of your choice and put into the steamer. 4. Cook until done. You know when its done when a fork comes out clean. Takes around 15 minutes. 5. Take out and pour oil generously on both sides. You can even cut the dumplings into smaller pieces with a knife if you wish. 6. Serve. Sprinkle some white sesame seeds to make it prettier :). You can also make crepes with this flour. Just add greens of your choice, add water to make a medium thin flowing paste and make crepes. Widely used in many recipes in India.Very easy to grow even in pots or just aluminum foil boxes. Nutrition: Very good source of Iron,Vitamin K, Protein.Raw juice controls insulin and so is advised for diabetics.Has lots of fiber and is advised for constipation.High in nicotinic acid and promotes hair growth. The seed paste is also applied on scalp to treat dandruff traditionally in India. 1. With rice : Stir fry a bunch of Trigonella leaves. To this add 1 cup washed rice(preferably basmati white) and stir fry. After 3 minutes add salt to taste, roasted garlic few pieces, 1.5 cups of water and let it cook until done.Optional ingredients are potatoes, green chillies, onions, tomatoes and roasted cumin seeds. Coconut oil and butter will give this rice more flavor. 2. With potatoes : Steam/Cook in a non-stick pan with lid covered. 2 big potatoes and a big bunch of Trigonella leaves.Add salt,oil and spices of your choice. Serve with bread. 3. Cutlets : Add raw chopped leaves to mashed potatoes and make cutlets by making small flat rounds and roasting. 4. In soups : Cook along with lentils of your choice. 5. Curry Recipes: 1) Steam cook and add roasted groundnut powder, salt, oil. 2) Stir fry with soaked split Moong lentils and add oil,salt to taste. 6. Stuffed bread: Traditionally flat stuffed bread is made with these leaves in India. The same way it can be mixed in Greek bread dough and baked. 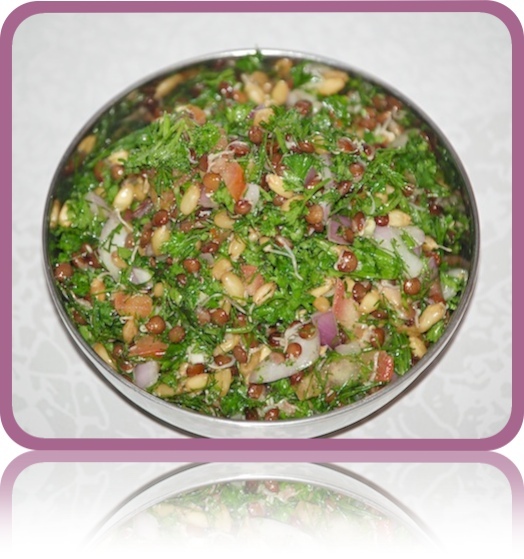 Also can be used as stuffing in Pita bread like spinach is used . 1. 25 Beet leaves( the tender, the better). 2. A small thin slice of Ginger. 3. 1 small Garlic clove. 4. 4 leaves of fresh Oregano. 6. 1 cup hot water. 1. Blend 1-6 items together. I use Vita-Mix. Normal mixer/grinder is not suitable for raw soups/smoothies. Try using any blender if you do not have Vita-Mix. 2. Transfer to bowls and add salt and oil to taste. Please feel free to request for recipes of any specific food item. Leave a comment to any existing posts to do so.